Dan Chinn was a wrestler. Along with his Hall of Fame brother Mike, they are the only brothers to both be state champions in the history of Grove City athletics. They are now both being enshrined into the Grove City High School Athletic Hall of Fame. Dan wrestled and lettered all four years at Grove City High School. He was a four time league champion, a three time sectional champion and a four time district qualifier winning that title three times. He advanced to the state meet three of those years placing as state runner-up in 1974, winning his weight class as state champion in 1975 and finishing third in 1976. He is the only wrestler in the history of our school to place in the top three at the state meet three years in a row. This 1976 graduate led the team to a 3rd place finish at the 1975 state meet, the highest team finish in school history. Dan was a member of the Ohio/USA Cultural Exchange to Iran Wrestling team, a four time Ohio All-Star and a High School Wrestling All-American. He attended Louisiana State University on a wrestling scholarship. 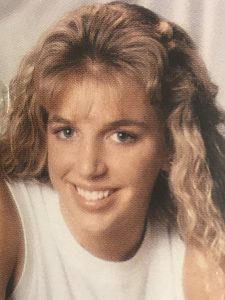 Jeri Hartley was an outstanding three sport athlete at Grove City High School. She earned a total of 9 varsity letters, 3 in Volleyball, 2 in Basketball and 4 in Softball. While she was a strong athlete in both Volleyball and Basketball, it was in Softball that she truly excelled. She earned 1st Team All-OCC honors in Softball in ’97, ’98 and ’99. She was 2nd team All-State in ’98 and 1st Team All-State in ’99. In Volleyball she earned 1st Team All-OCC honors in both ’97 and ’98 with Hon. Men. All-District in 97 followed by 1st Team All-District in ’98. She set several school records in Softball; Doubles (10), Triples (3), At Bats (100), Hits (44), RBI (34) and HR (4). She is the only GC player to ever hit for the cycle (vs. Lakewood in ’99). The Lady Greyhounds were OCC Champs all four of her playing years. They were District Champs in ’97 & ’98 and District Runners-Up in ’96. In 1998 they advanced to the State Final Four. A very strong academic student, she was inducted into the National Honor Society her junior year. She won the Dispatch Scholar-Athlete Award in ’99 and was also named as OCC Scholar Athlete for Softball in ’99. She earned a full tuition softball scholarship to Butler University (Div. I) where she continued her outstanding play. There she was selected to the MCC All-League team (2000) and as a member of the MCC Newcomer Team. She was 1st Team All-Horizon League in 2003 and led Butler to the 2002 Horizon League Tournament Championship Runners-up where she won the batting championship and was selected to the All-Tournament team. She continued her record setting with doubles (15) and runs (42) in 2003. Additionally, she was 11th nationally in doubles/game in 2001. She was Academic All-League 2001-2003 and placed on the Butler University Honor Roll 2001-2003. She also earned berths on the Purdue Invitational and Kentucky Invitational Tournament Teams. She was selected as team MVP following the 2003 season. Academically, she also received the Outstanding Math Student Award in 2003. Jeri has served as varsity softball coach at Logan Elm H.S. for the past 8 years during which her teams have won district titles in 2009, 2010 and 2011, winning the MSL Championship in 2011. 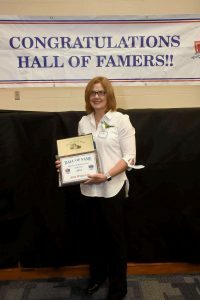 She was honored as District Coach of the Year in 2010 and MSL Coach of the Year in 2011. She currently teaches math and coaches varsity softball and freshman volleyball at Logan Elm HS. She is married to Michael Hartley. They have two children, Ayden and Eastyn. 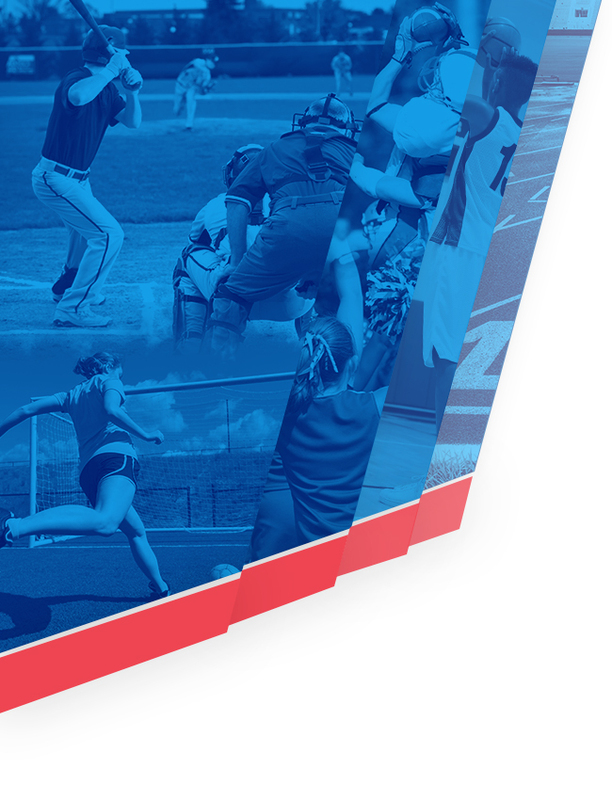 Every successful athletic program has individuals who make significant contributions behind the scenes to help teams, coaches and individual athletes be successful. Gary Leasure is one such individual in Grove City. He is a true difference-maker for the Grove City athletic program. Athletics was always important to Gary as a youth. He was an offensive/defensive lineman for the 1960 Zanesville H.S. Central Ohio League Championship football team. He attended Ohio University before returning to his native city of Zanesville. There he became involved in local politics and served first as a member of city council before being elected mayor. Gary moved to Grove City in 1978 and opened his business, Ace Truck Body, and continued his civic involvement here. 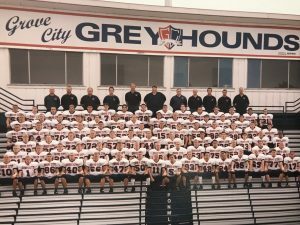 While his children attended Grove City High School, Gary quickly became involved with the Greyhound Athletic Boosters and eventually served as that organization’s Vice President. Gary could often be found working in the booster concession stands. Additionally, he spearheaded the bingo initiative for several years that helped fund athletic teams for the high school. Several times, he underwrote the costs of the pre-game meals for the football team. Gary was (and is) generous with both his time and his resources. One of his biggest contributions was chairing the successful school operating levy in 1994 that essentially saved athletics for the district. Following that effort, he ran successfully for the SWCS Board of Education where he influenced decision making on behalf of athletics during his terms on the BOE. He pushed for the creation of the position of Supervisor of Athletics to assist with athletic administration and supervision of school athletic events and facilities. Gary has served as a Trustee of the Success Beyond the Classroom Program that helps cover pay-to-participate fees for low income student athletes. Other notable community contributions are: serving as Vice President of 648 Mental Health and Mental Retardation Board for 8 southeastern Ohio counties; past Chairman of the SWCS Educational Foundation; past President of WABA; past President of the Grove City Area Chamber of Commerce. He has been a major donor to the Mid-Ohio Foodbank; the GCHS Marching Band Rose Parade trip; and the GCHS Turf Project. 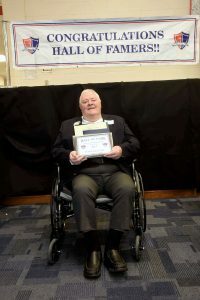 He donated a pitching machine to the FHHS softball program and serves as a member of the Grove City Planning Commission. He has received the Jaycee Distinguished Service Award and been honored for the 2016 Turkey Wattle. Truly, Gary Leasure has consistently put his money where his mouth is and takes action for both the school athletic program and the Grove City Community at large. Sarah Cook was a dominant force on the basketball court during her years at GCHS. This 1997 graduate was one of only a few Grove City athletes to earn 1st Team All-OCC honors all four years. She is in the record books as a 1,000+ points scorer with a 55% FG average. As a sophomore she was selected as the OCC Division Player of the year. She was selected as 1st Team All-District once and 2nd team All-District 3 times. She earned Honorable Mention All-Ohio status during her freshman and sophomore years and Special Mention All-Ohio status during her junior and senior years. Furthermore, she was selected as team Captain and MVP during both her junior and senior seasons. Sarah earned a basketball scholarship to the University of Toledo. In the fall of 1978 Grove City High School hired a new football coach. Jack Lehr, a Cincinnati native, was hired away from Bishop Luers High School in Fort Wayne, Indiana where he enjoyed great success as head coach. Jack was an outstanding football player at Cincinnati Purcell HS. He was selected to play in the US Army North-South All-American game and earned a football scholarship to the University of Wyoming. He transferred to the University of Michigan and played for Wolverines under Head Coach Bump Elliott. In 1985 Jack transitioned to the position of AP/AD and administered the overall athletic program for the school. His influence was immediately felt as he authored the proposal that won GCHS its’ first Harold E. Meyer Sportsmanship Award granted by the OHSAA in that award’s first year of existence. 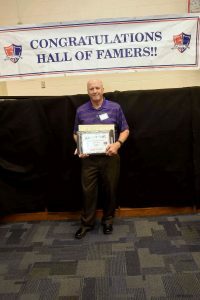 His emphasis on good sportsmanship was so great that he was honored as the Central Ohio Basketball Officials Athletic Director of the Year in 1989. He was featured in an article entitled “Officials Feel Welcomed in Grove City” in the National Federation News. 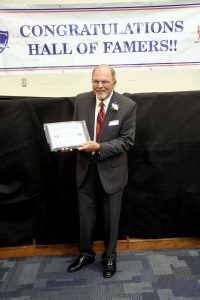 In 2001, Jack was inducted into the OCC Hall of Fame for his work as coach and athletic director. Things do not stop there. Jack has always been deeply involved in supporting Special Olympics. He served as an assistant Special Olympics track coach and freely admits that he was the #1 cheerleader for the Special Olympics bowling and track teams. He was a featured speaker at two Special Olympics State Conventions and authored a national coaching magazine article urging coaches to become involved with special needs children. He has several articles published about football, Special Olympics and the importance of volunteering for those needing special help. Jack moved from the AP/AD position to become Principal of the Paul C. Hayes Technical High School from 1995 until his retirement in 1998. Since then he has been actively involved as a Hospice volunteer, serving at the Heinzerling House, assisting with GED tutoring, serving as the “Voice of the Greyhounds” as PA football announcer for several seasons and, after moving to Micco, Florida, working with the Veterans’ Administration, and Hospice in that community. Jack was an outstanding teacher and very successful head coach. He was a very capable school administrator and a wonderful and caring community volunteer. He helped Co-Chair the GCHS Athletic Hall of Fame during its development before he relocated to Florida. He continues to give back in every way possible and remains a solid supporter of GCHS athletics to this day. Lori Patzer was one of the finest athletes ever to wear the Crimson and Blue of Grove City HS. She earned a total of 12 varsity letters, 3 each in Soccer, Basketball and Softball. She earned individual honors in all three sports as well. She was 1st Team All State in Soccer, All-Midwest, All-OCC and All-District. She was the leading scorer in central Ohio her senior year (36 goals). In Softball she was All-OCC, All-District and 2nd team All-State as her team won the State Championship in 1983 and finished runners-up in 1984. She earned All-OCC honors in basketball. She captained all three sports teams including serving twice each in Soccer and Softball. She was selected to the USYSA District Team and State Team (Ohio-South), and the USYSA Region II Select Team. Her individual stats include a total of 68 career goals and 15 total assists in the ’84 season. She was selected as a member of the Worthington Invitational All-Tournament Team in both ’83 and ’84. This success led her to being picked as a Counselor-in-Training at the R & R Sports Camp at Ohio Wesleyan University. She was very versatile as a softball player starting in center field as a junior (State Championship) and catching as a senior (State Runners-up). She was a starter on the varsity teams for three years in each of those sports. A strong student with outstanding leadership skills, Lori was a class officer for all four years of high school and served as a member of Student Council all four years. Combined with her athletic prowess, this earned her a Softball Scholarship to Ohio University where she graduated with a degree in Speech and Hearing and a minor in Business. Lori has served as a varsity assistant Soccer Coach at GCHS ‘97-’99 and a varsity assistant Softball Coach during those same years. 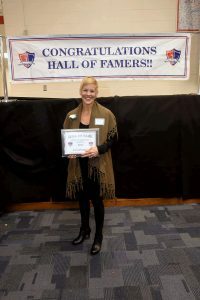 In addition, she served as a volunteer youth soccer coach, assisted with Special Olympics and taught community sign language classes for the City of Grove City. 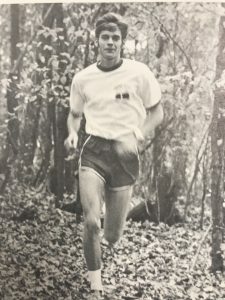 Quite possibly the best ever distance runner in the history of our school, Bill Rodeheffer was a dominant force in track and cross country for the Greyhounds. He was undefeated in dual and triangular meets his senior year setting records in both the mile (4.25) and two mile (9.19) runs. He was District Champion in Cross Country for two years, undefeated as a senior. He set course records in almost every meet he competed in during his senior year and was named High School All-American as a senior. In Cross Country, he set the course record at Raymond Memorial Golf Course, the site of the Central District Cross Country Meet. He was twice selected as Runner-of-the-Year in the Central District in 1975 and 1976. Bill led by example. His quiet demeanor served as an inspiration for his teammates as he regularly pushed them to set their personal best performances. His passion to excel extended beyond athletics as he sat first chair trumpet in Symphonic band and was selected to the Franklin County All-Star band. He served as band President his senior year. He was unsurpassed in the classroom graduating with a perfect 4.0 GPA (before weighted grades). He won the GCHS Agonis Club Award. He matriculated to Oregon State University, a distance running Mecca, before suffering career ending injuries and illnesses. He earned his BS from Oregon State, his MS in Adult Fitness and Cardiac Research from the University of Wisconsin-La Crosse and obtained his K-8 teaching certification from Washington State University (1989). Bill extended his reach clear to Taiwan (1994-1998) where he taught computer skills, math and Bible study at the middle school level. He has coached high school track and cross country for ten years, middle school track for ten years, and served five years as coach of a community running club. Certainly Bill Rodeheffer has set the standards for excellence for running for Grove City athletes. Some earn Hall of Fame honors by excelling in a single sport. Others are proficient in two sports. 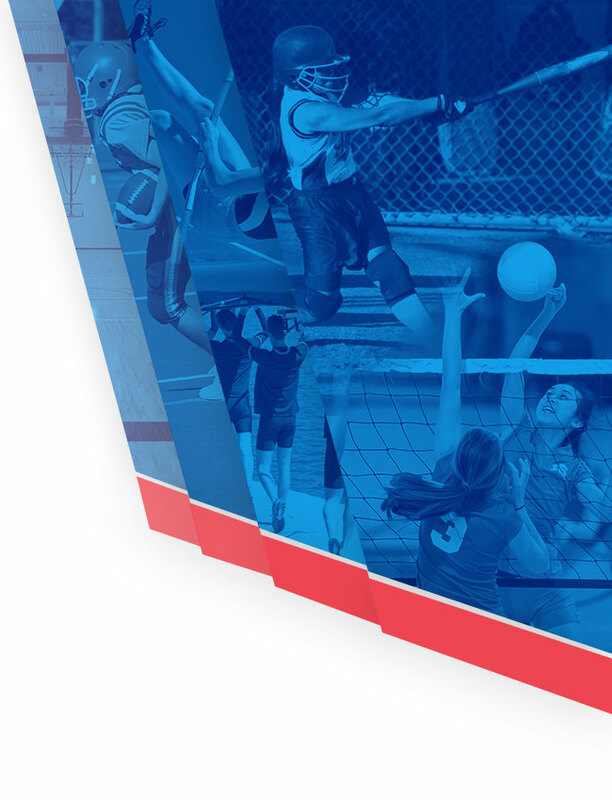 The exceptional athletes play year round in three sports. Amy Wheeler was an outstanding athlete in four sports, concurrently competing in Cross Country (1) and Tennis (4) while Swimming (4) in the winter, setting many school records, and finishing the year with outstanding performances in Track and Field (4). In so doing, she earned 13 varsity letters, more than any other athlete in the history of Grove City High School. That athletic prowess transferred directly into the classroom where she was selected as a member of the National Honor Society and earned S.T.A.R. and Renaissance honors. She was regularly on the school’s Honor Roll at the highest level and graduated in the top 10% of her class. She was voted Most Athletic Senior and nominated for the Scholar-Athlete Award. She received the Jim Weber Athlete of Distinction Award and was named an Army Scholar-Athlete. She earned her Bachelor of Exercise Science Degree at OSU and an MBA Degree at Franklin University. Amy was a four time state qualifier in swimming (team captain) setting several school records (200 IM, 100 Breast, 100 Fly, 100 Back, 200 Medley) some of which still stand 30 years later. She was All-OCC and All-District in Cross Country and Track. She captained her track team and was selected as MVP Runner setting school records in the mile, the two mile, the 4 X 400 Relay and the 3200 relay. Amy qualified four times for the state Swimming meet, once for the state Track meet and was a regional qualifier in Cross Country. She qualified for the Mid-West Meet of Champions (track) in the 3200 m. run. At Ohio State, she earned 4 letters in Cross Country and 3 in Track, was Academic All-Big Ten and earned the Scholar-Athlete Award 3 times. She qualified for the first World Triathlon Championships in Avignon, France and was named to the 1989 Triathlon Today All-American team. She continued competition in the Ironman 70.3 Events and placed in the top 40 in the USA Age group National Triathlon Championships. 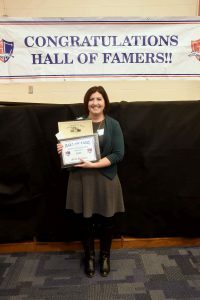 She has served as head coach for the GCHS boys/girls swimming team and also as an assistant swimming coach for the Upper Arlington HS swim teams. Joe Hutcheson, Class of 1990, was a three sport athlete at GCHS participating in football, basketball and baseball. Joe was an All-Ohio placekicker on the 1989 Greyhound football team and earned an appointment to the United States Naval Academy in Annapolis, Maryland. He transferred to The Ohio State University where he graduated with a Bachelor of Science Degree in Aircraft Systems. In December of 1995 he was commissioned as a 2nd Lt. through the Platoon Leaders Course. In July of 1996 he reported to Naval Air Station (NAS) Pensacola, FL for Naval Flight Officer (NFO) training with VT-10 and VT-86 and was designated a Naval Flight Officer in March of 1998. He then reported to MCAS El Toro, California for training as a Weapons System Officer (WSO). He deployed three times with the “Green Knights” including combat tours in Kuwait and Kyrgystan flying F-18 aircraft. In 2002 he was selected for NFO-to-Pilot transition training and reported to Corpus Christi, Texas. After receiving additional training in military jets, he was designated as a Naval Aviator in July of 2004. Then a Major, he reported to NAS Lemoore, CA for replacement training as an F/A -18 pilot. In April of that year he was designated as an Instructor in the F/A-18 aircraft. During this tour he served as the Logistics Officer, the Standardization Officer, the F/A-18 Simulator Contract Officer Representative and the Aircraft Maintenance Officer. In July of 2011 Lt. Col. Hutcheson transferred to Headquarters Marine Corps, Department of Aviation, at the Pentagon in Washington D.C., where he served as Joint Strike Fighter Transition Task Force Lead. In June 2013, he was appointed by the Defense Contract Management Agency to represent the government’s interests in the Lockheed-Martin F-35 plant located in Fort Worth, Texas. He currently serves there as Chief of Flight Operations, Government Flight Representative, and F-35 Acceptance Pilot. Lt. Col. Hutcheson has been awarded the Air Medal, the Navy and Marine Corps Achievement Medal, the Navy and Marine Corps Commendation Medal and the Navy and Marine Corps Meritorious Service Medal. He is married to the former Nadine Martin of Grove City. They have three children, Danielle, Cade, and Ryan.